Who would have guessed what the Holy Spirit had in mind? In the spring of 1994, Rev. Robert Rahn was guest preacher at Guardian Lutheran Church in Dearborn, Mich., where the people were bidding a fond farewell to one of their members about to become a missionary in Russia – Matthew Heise. Rev. Heise’s experience as a missionary in Russia and other regions of Eurasia have proven invaluable in leading LHF to serve other missionaries and church bodies. LHF Executive Director Rev. 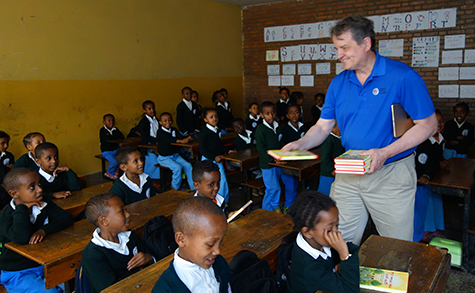 Matt Heise delivers Amharic-language Bible storybooks to Lutheran school children in Ethiopia. “I saw firsthand people reading LHF’s materials, such as Luther’s Small Catechism and the Book of Concord, and it made a change in them,” Rev. Heise said. He also experienced what it was like to try to share the Gospel in regions where no Lutheran – or sometimes even Christian – literature existed in the language of the people. As LHF continues its work of translating and publishing books like the catechism, Rev. Heise sees a need for even more basic materials. In looking to LHF’s next 25 years, Rev. Heise said he’s most excited about LHF’s new work beginning in Asia and Africa. “The idea of Christianity moving to the southern hemisphere really is true,” he said. “There’s an explosion of faith in those areas, and I’m excited to see how LHF’s work in Asia and Africa, in particular, will expand.